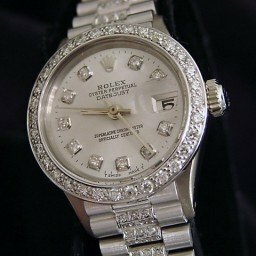 Whether you opt for a classic ladies Datejust 26 with a Jubilee bracelet, a prestigious ladies Datejust 26 with a President bracelet, or the opulent ladies Datejust Pearlmaster, a Rolex Datejust ladies white gold timepiece is a tasteful addition to any womans watch box. 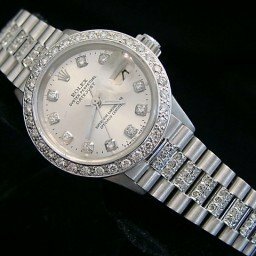 Our fine collection of Rolex Datejust ladies white gold watches are 26mm and include many dial choices. Also, we offer a variety of bezels and bands with diamond options.  Keep in mind, we offer a 30-day money-back guarantee, free U.S. shipping, and available financing with each purchase. As an added benefit, we offer after-sales support and a Lifetime TradeUp guarantee on qualified items. This means you can come back to us when you want to upgrade to another model. So, please don’t hesitate to contact us. For ladies who appreciate the finer things in life but adhere to an understated sense of style, there’s the white gold ladies’ Datejust. Supremely precious due to its solid 18k white gold construction yet elegantly refined thanks to its white metal color, the white gold ladies’ Datejust is a great choice for an everyday luxury dress watch. Let’s check out some popular versions of the white gold ladies’ Datejust timepiece. 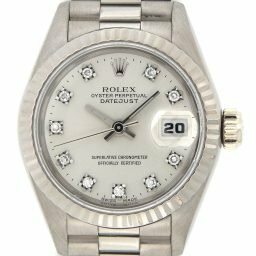 Just like other versions of this luxury watch for women, the white gold ladies’ Datejust 26 is a varied collection with plenty of options to choose from. 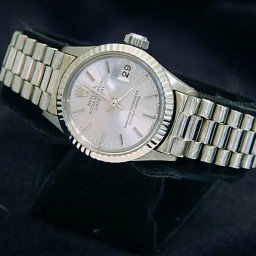 As a long-running model, there are white gold ladies’ Datejust 26 from the 1950s, 1960s, 1970s, 1980s, 1990s, and 2000s. As the name implies, these models all sport 26mm Oyster cases in solid white gold along with a solid white gold Jubilee or Oyster bracelet. Bezel options range from fluted to diamond-set. Some versions even have diamond-set lugs too. Naturally, dial choices are plentiful with a range of colors, patterns, and diamond adornments to pick from. 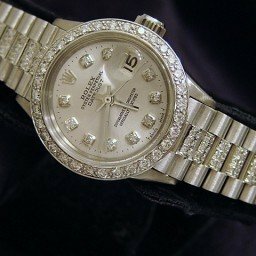 While all white gold ladies’ Datejust 26 watches run on Rolex automatic movements, depending on the era of production some have the quickset date feature and some don’t. Also dependent on the manufacturing date is the use of acrylic or sapphire crystal protecting the face of the watch. 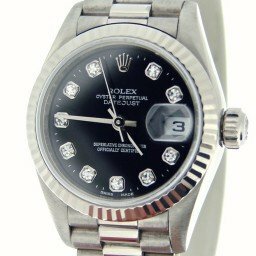 However, regardless of the type of crystal, all white gold ladies’ Datejust 26 do of course have the Cyclops magnification lens above the date window at 3 o’clock for which the collection is named after. Special versions of the white gold ladies’ Datejust 26 timepieces are the President ones. 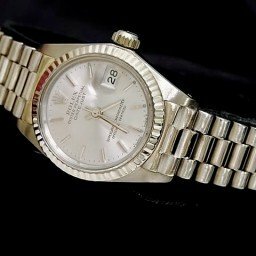 The ladies’ Datejust President models come equipped with the famous Rolex President bracelets typically found on the men’s Day-Date models. With the iconic trio of semi-circular links, the President bracelet is almost as famous as the watches themselves. Since the President bracelet is exclusively made in precious metals, it’s a quick way to differentiate between a steel model and a white gold ladies’ Datejust model. Along with the smooth 18k white gold President bracelet, there are also some embellished with diamonds or textured “bark-like” center links. A spin-off collection of the Lady Datejust, the Pearlmaster is Rolex’s lavish jewelry watch lineup exclusively made in 18k gold. The Pearlmaster gets its name from its solid gold bracelet with appealing curvy five‑piece links that wears very much like a piece of jewelry. The white gold ladies’ Datejust Pearlmaster is available in a few different sizes including 29mm, 34mm, and 39mm Oyster cases. There are also plenty of gem options ranging from classic white diamonds to colorful fancy sapphires.